Despite heightened security, recruits find alternate routes to join Islamic State fighters. Along the southern frontier of the European Union, a small but growing number of aspiring jihadists are blazing trails by road and ferry to Syria’s battlefields, sidestepping heightened airport security and slipping through the holes in Europe’s intelligence dragnet. Some fighters follow meandering bus routes through several countries en route to the more loosely guarded border of Bulgaria to Turkey. Others engage in what authorities call “broken travel,” using family visits or holiday destinations as an initial leg to mask their final destination. That was how the wife of Paris terrorist Amedy Coulibaly slipped into Syria days before her husband killed four people at a kosher grocery last month. The woman, Hayat Boumeddiene, drove from France to Spain, then flew to Turkey before joining Islamic State in Syria. She later called for others to join her, in an interview with the militant group also known as ISIS or ISIL. Western diplomats and intelligence officials say most aspiring European fighters still try to fly directly to Turkey, which borders western Syria. But the growing use of alternative routes magnifies a security challenge for EU policy makers: How to catch suspected militants without undermining the bloc’s commitment to free movement across a region where passport and customs checks at national borders have been effectively abolished. U.S. intelligence agencies reported last week that despite greater Western efforts, foreign fighters are streaming into Syria and Iraq to join extremists. 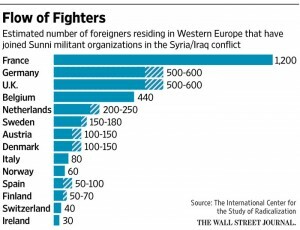 An estimated 20,000 foreign militants there include at least 3,400 Europeans. About 100 in Syria are believed to be from the U.S.
A series of high-level EU meetings in Brussels this month is seeking to revamp the EU’s counterterrorism strategy by bolstering information exchange. European officials say intelligence agencies have in recent months expanded the sharing of terror suspect names. On Thursday, EU leaders agreed to broaden use of the region’s law-enforcement databases—including passenger flight details—to block the exit of potential fighters.